I absolutely love the dutch / UK sellers from The House of Mouse!! You should look at their shop! 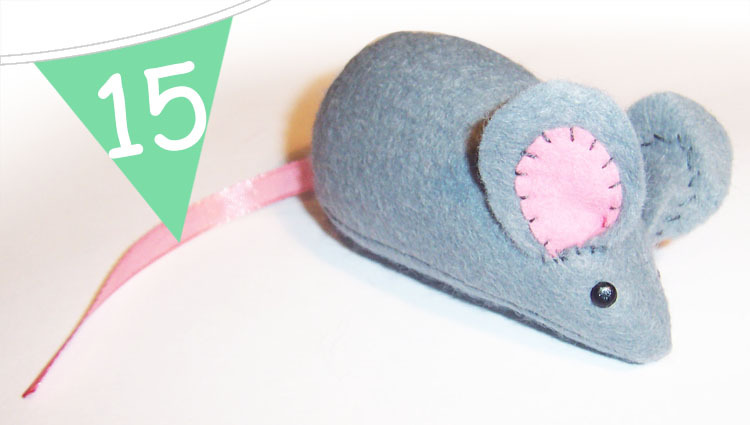 They make the most creative little mice ever! 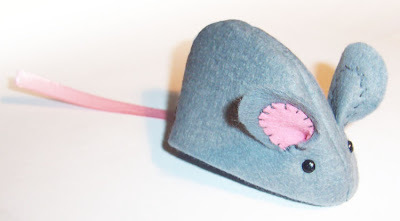 But if you feel like something a bit less technical I have a simple felt mouse tutorial for you today. And basic sewing equipment, needle, thread etc. 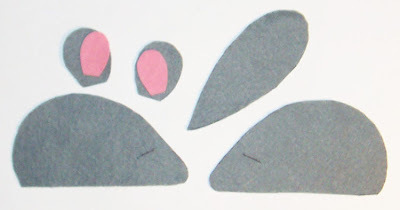 Start by printing off the pattern above and cutting out all the pieces from felt. I used a light grey felt for the body and pink for the inner ear. Stitch each inner ear to the outer ear and fold the ear nearly in half and add a few stitch to hold in place. 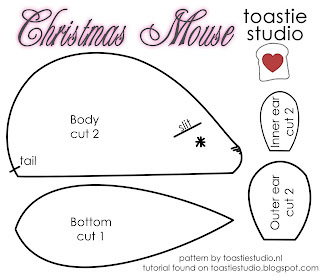 Place your two mouse bodies with right sides together (so the ears face inwards) and sandwich the tail ribbon inwards near the mouses bottom. Stitch around the top edge. Turn the body right way out and position the eyes so they match. I used mini brads but you could use buttons, or beads or a simple french knot etc. Turn the mouse wrong way out again and pin the bottom around the edges of the body, lining up the nose point and bottom point. Sew around the edge leaving a gap to turn later on. Turn mouse right way out and stuff him , making sure you get his nose nice and pointy. Then ladder stitch the turning hole shut. 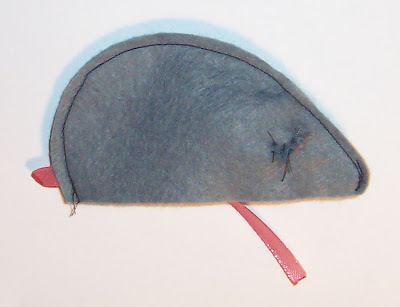 Mousey is finished and ready to hide under the Christmas tree! This entry was posted in Christmas, Christmas 2011, Christmas Advent, Fabric, Felt, Tutorials on December 15, 2011 by Handmade Cuddles. to go with a Mr. &Mrs. Mouse set they play with and tis was perfect! You are the best!!!!! So glad you like it! Hope you make a lovely happy mouse family!! 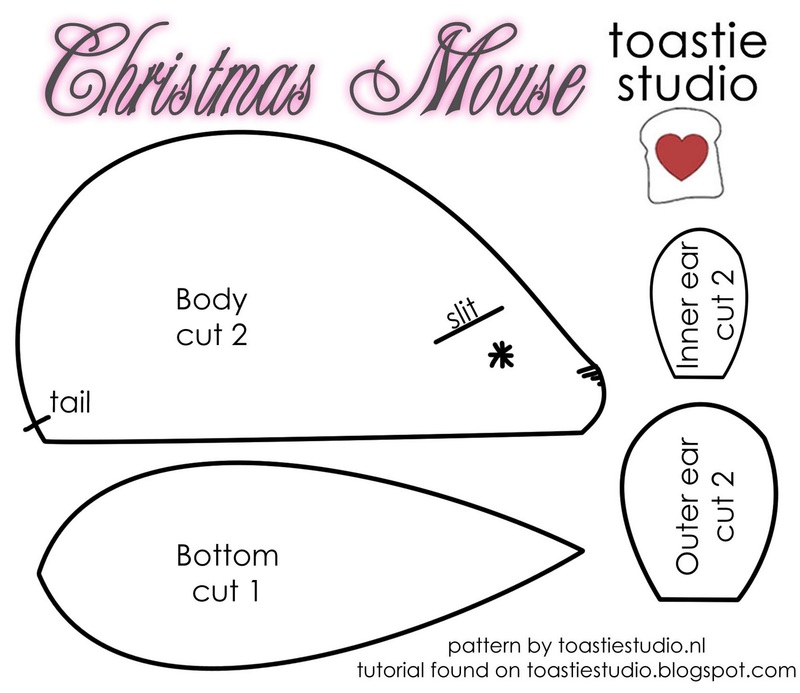 This is the perfect pattern for our Christmas mouse that eats the crumbs out of the bottom of our stockings. I am having trouble printing the pattern. I can’t get the ears part. It prints it too big. Great pattern but real mice are NOT horrid and scary. Real people are though.